Combine 2 cups of flour, salt, and water in a large mixing bowl. Mix with a wooden spoon until it turns into a lump. Then knead it by hand for a 3-5 minutes until the dough gets a little softer. Cover with cling wrap and let the dough sit for 20 to 30 minutes on the kitchen counter. Take the dough out of the plastic bag. It will be a little softer and moist and easier to handle. Knead it for 5 to 7 minutes, until it’s smooth and elastic. It should be very stretchy. Cut the piece of dough into 8 equal sized pieces. Roll each piece out with a rolling pin to round circle disks. Repeat with second half of mixture. In a dash of oil, fry leek, carrot, mushroom, tofu and green beans in a hot pan for 1 minute. Add cayenne or chilli sauce and stir through. Add soy sauce and stir until the sauce is almost all evaporated. Add beer, a ‘slosh’ at a time until the beer is all evaporated. Taste mixture and adjust seasoning. To make dumplings, place a small spoonful of the filling in the centre of the skin. Dab a little water with your finger and circle around the edge of the skin, and then fold in half and seal the edges. To pan fry the base of the dumplings, coat a frying pan with a little cooking oil and turn to medium heat. Place the dumplings on the frying pan and then turn the heat to high. Pan fry the dumplings until the bottoms turn golden brown and crisp. Add the water and cover the frying pan with its lid immediately. Cook until water has evaporated and turn the heat to low. Cook the dumplings for another 2 minutes or so, dish out and serve hot with a dipping sauce! 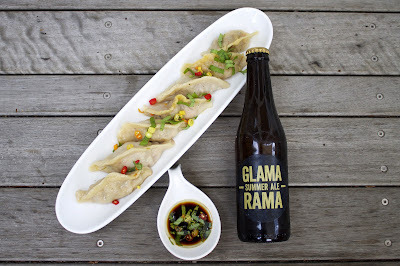 This recipe was kindly shared with us by Renae Smith (Masterchef 2014), which she created using a Sydney Brewery beer called Glamarama. Learn more about Renae at www.renaesmith.com.au.